Matthew 8:19 - 20 Then a scribe came and said to Him, "Teacher, I will follow You wherever You go." Jesus said to him, "The foxes have holes and the birds of the air have nests, but the Son of Man has nowhere to lay His head." 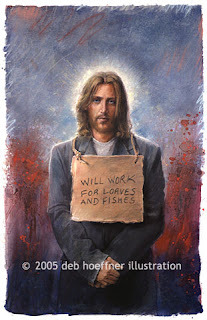 I never really thought of it before, but Jesus was homeless. He was a wanderer of sorts. Going from place to place. So, for those of us who follow Jesus, I suppose we are following a man who lived a homeless life for at least several years. Interesting!